We would like to thank Saskia Wild from Simply Sorted for this fantastic article on how to keep your kitchen organised and de-cluttered. Below this article, all her contact details and services are listed. For many families, the kitchen is seen as the heart of the home. It’s where family and community life happens. In this space, hearty meals are prepared, art is created, calls are made, ideas are shared, and it’s where family fun and catch ups are the order of the day. Here are some tips to help you create a functional and organised space in your home. 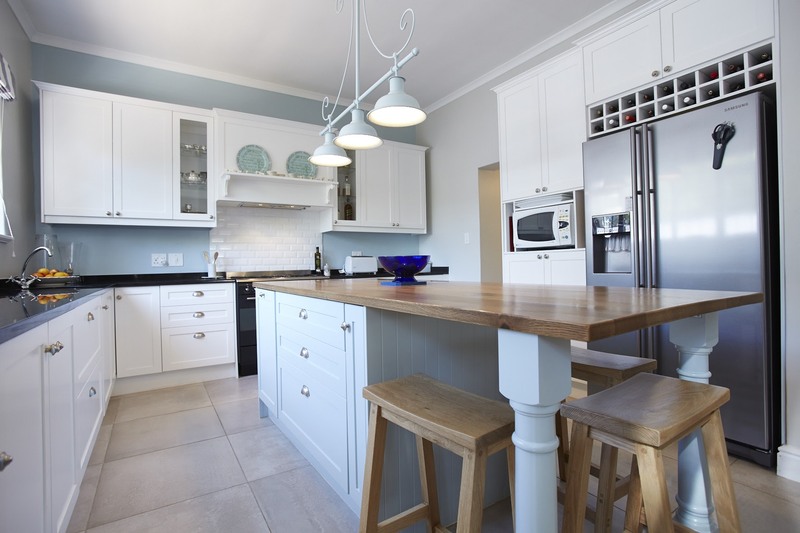 Ensure that you kitchen is clean before you start de-cluttering. Gather your tools – cleaning materials, black bags for rubbish, boxes labelled: “recycle”, “another room” for items that belong in another part of the house, “donate”, “sell”. Start de-cluttering from one corner of the kitchen and work clockwise. If you feel overwhelmed by the idea of tackling the whole kitchen, set a timer and de-clutter in 15-20 minute sessions. Tackle one shelf, drawer or cabinet at a time. This will keep you focussed and will help you from becoming overwhelmed. Take everything out of that space and put it on the kitchen counter. Make a decision about each item that you pick up. If it is to stay in the kitchen, place like items together. If the item should go into another part of the house, put it in the “another room” box. If it is to be sold, donated or recycled put it in the relevant box. Rubbish goes into the black bag. Throw away any food that has passed its use by date. Group items into categories that are logical: Food – pasta with rice and legumes; snacks and treats, herbs and spices with vinegars and oils; dairy, fruit and vegetables. Utensils: food preparation utensils ( chopping knives together, chopping boards, measuring cups and spoons); baking utensils (muffin tins with cake tins and cookie cutters with cake icing equipment); cooking utensils (wooden spoons, ladles and whisks together; pots and pans together). Crockery and cutlery: cereal bowls, dinner plates and side plates together; knives, forks, tea-spoons and tablespoons together. When the area has been de-cluttered, then clean it and organise it in a way that makes sense to you. Place heavy items or appliances that are less frequently used, in lower cupboards. Lighter items and items that are used regularly, can be kept in higher cupboards or shelves. Eye-level storage or shelves are practical for food stuffs that are used most often (cereals, canned foods, snacks). Bear in mind which food items your children need to be able to reach. Place items where you use them. Pots, pans and baking tins close to the oven and stove; spices and cooking utensils near the stove and oven; knives near the cutting boards, mugs and tea/coffee close to the kettle; dishes and cutlery near the dishwasher. Cleaning equipment and material under the sink. You have completed the cycle of de-cluttering and organising when you action these boxes. Place the items in the “Put Away” box in their rightful space in your home. Place the “Recycling” box in your car to take to the recycling depot. Decide how you are going to sell items in the “Sell” box and to whom you are going to give items in the “Donate”. Once you have finished de-cluttering and organising, take a step back and have a look at what you have achieved. Assess how you feel about your newly organised space. Do you feel a sense of achievement or relief? Do you feel a sense of liberty and freedom? Do you feel that this process will save you time, money and emotional energy? Reflect on what you have learned in the process and the rewards of being organised. Have you realised that it is ok to let go of your stuff and that it is ok to live with less? Are you looking forward to spending more time with your family and friends in your home? Are you looking forward to being more productive in your organised space? Reward yourself for the time and effort taken to organise this space. It could be something as simple as sitting down with a cup of tea and your book or treating yourself and a friend to a coffee at your favourite coffee shop, going to a movie or the theatre, going for a picnic or starting a hobby that you never had time for. This will inspire you to get ready for your next organising project. If you have not used the item at all, give it away or sell it. If you have only used it once in the year, give it away or sell it. The exception here is if it is an item that you use seasonally – items like slow-cookers for winter stews and Christmas cookie cutters etc. Toss if it’s broken or chipped. If you have duplicate sets of items, choose the best of them and get rid of the rest. Toss pots and pans that have no handles burn marks or are rusty. Toss items that you don’t like and have never used. This included gifts given to you. Only keep items that you use and love. We offer on-going assistance for those who feel that they are unable to maintain the systems that we have put in place. We will customise a plan that suits your needs. Next Next post: Your Kitchen Is The Most Important Room In Your House!